22. And behold, a woman of Canaan came. A woman of Canaan came out of the same coasts, and cried unto him, saying, Have mercy on me, O Lord, thou son of David; my daughter is grievously vexed with a devil. 23. But he answered her not a word.And his disciples came and besought him, saying, Send her away; for she crieth after us. 25. Then came she and worshipped him, saying, Lord help me. 26, 27. But he answered and said, It is not meet to take the children's bread, and to cast it to the dogs. And she said, Truth, Lord: yet the dogs eat of the crumbs which fall from their masters' table. 29, 30. And Jesus departed from thence, and came nigh unto the sea of Galilee; and went up into a mountain, and sat down there. And great multitudes came unto him, having with them those that were lame, blind, dumb, maimed, and many others, and cast them down at Jesus' feet; and he healed them. 31. Insomuch that the multitude wondered, when they saw the dumb to speak, the maimed to be made whole, the lame to walk, and the blind to see: and they glorified the God of Israel. As we move through this journey towards Pascha, we must continue to prepare our hearts, minds, and souls so that through our lives, the Gospel of salvation may be proclaimed to all. "who, though He was in the form of God, did not count equality with God, a thing to be grasped, but emptied Himself, taking the form of a servant, being born in the likeness of men." We are reminded of the mission of Christ, where His "coming out" was in accordance with God’s will so that we might experience salvation. If we think from the perspective of this Canaanite, a member of a race of people that have been cast out from the presence of the Jews. This person being a woman, we must be aware of the great shame this woman had taken upon herself in order to come before Christ to make her plea. We have a duty, whether we are weak or strong, rich or poor, to find our way to Christ, who has made His journey to us a reality. It is only through the "coming out" of both Christ and this woman that this situation could have been a reality. So, when this woman comes out and seeks mercy because an evil spirit has possessed her daughter, Christ does not utter even one word. 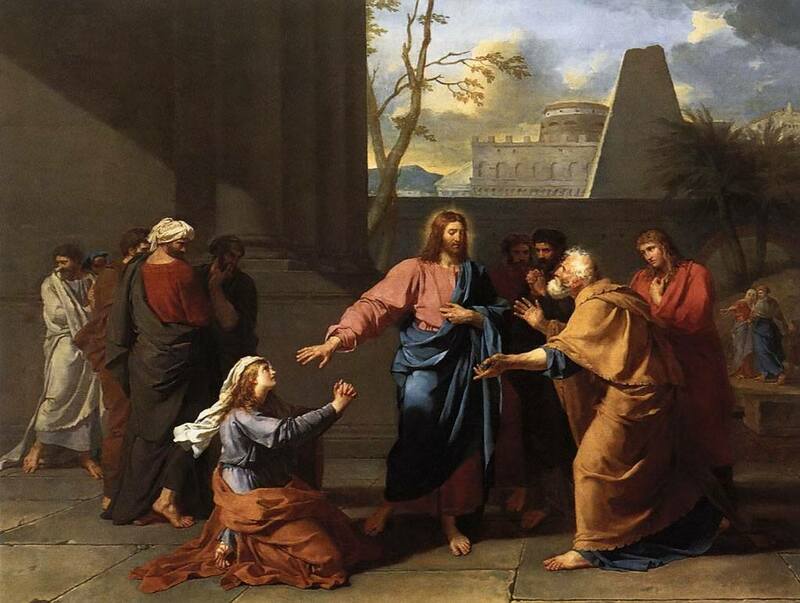 It is a strange occurrence in the course of this Gospel that we see a non-responsive Jesus, who utters not a word when this Canaanite woman shames herself in order to come before His presence. Usually we see a Jesus who is responsive to all those who entreat Him, beseech Him, and question Him. It is definitely an interesting occurrence, but such events are utilized in order to bring the reader to attention. The very fact an account of this nature exists in scripture, one where we see Jesus displaying ideals contrary to what we usually are accustomed to, serves to teach us a powerful lesson. The focus of Christ’s message is not based on this Canaanite woman’s understanding, but on the understanding and faith of the disciples or the reader. Now this woman, who lowered and shamed herself, probably hearing that Jesus had healed others, is faced with rejection. If we were placed in a similar situation, and we failed to obtain that which we have worked so hard for, most would simply desist and move on. We would not realize that it is a call for perseverance, and a call to strengthen our faith. If silence was not enough of a deterrent, the use of such strong language by Jesus should have been a clear indication, at least to the reader, that this woman should have left His presence. When Jesus makes the statement that He was sent only for the sheep of Israel, we must ask ourselves, if this was the case, then how did we, mere Gentiles, find our way to Christ? Christ is challenging the listener, and He is calling to their attention the response of faith that would soon come from the innocent woman, who is coming to Christ only in faith and knowledge that He is the Lord. When Christ says, "It is not fair to take the children's bread and throw it to the dogs" it is the humble response of this woman that reveals the true nature and desire for Christ’s mercy. This woman knows she is not worthy, but she humiliates herself to a point where she responds to Jesus saying that even a dog finds its place around the master’s table. The dog takes no part in the meal, but it will receive and eat what he is able to. We must all stand in awe at the humility of this woman! Even when she is denied, she persists. Even when she is compared to a dog, she resists pride, and she lowers herself to accept her place in order to receive even a small amount of mercy from Christ. My friends, we must be able to empty ourselves of pride and any worldly thoughts so that instead, we may be filled with the love and mercy of Christ, so together with Him, we may become coworkers of the Gospel. Jesus Christ had rejected this woman several times in order to reach the climax of this account where he exclaims, "O woman, great is your faith!" This woman is given a crown, and she has found honor in the sight of the Lord. Christ told this woman, "Be it done for you as you desire" words full of meaning but display clearly the true power of our faith in God. For in the same Gospel, two chapters later it is said by our Lord, "For truly, I say to you, if you have faith as a grain of mustard seed, you will say to this mountain, `Move from here to there,' and it will move; and nothing will be impossible to you." The wheels from the car screeched. The mother’s heart stopped. The child screamed. The mother ran to the street out in front of the house as fast as she could. She was scared spitless when she saw the tricycle and her daughter lying on the pavement. That’s the way mothers are. That’s the way fathers are. Anytime your child is injured and anytime your child is sick, you become very, very upset, especially if the child is seriously ill or injured. That is just the way God wired us as mothers and fathers. You can tell your stories and I can tell my stories about illnesses and injuries. For example, when our child Anne was little, maybe three years old. I came home one afternoon and you could feel the tension in the house as you opened the front door. A dog had bit my daughter right across the face. It was ugly. We rushed off to the doctor as fast as we could. We were totally upset. The doctor stitched her face up as she way lying there in a straight jacket. It was not a fun afternoon. This nasty event feels like it occurred just like yesterday but it happened more than two decades ago. Or the time our little boy fell off the swing and had a huge cut under his chin and we were off to the doctor again. Totally upset. Or the time that the same little boy grew up and was driving a car and had a car accident. The police called and said that our son was in the emergency ward. The police didn’t tell how bad he was other than we should get there real fast. As parents, all of us are deeply and profoundly upset when our children are injured or are seriously sick. It is very upsetting for all of us who are parents. Most recently in our parish, there was a young girl by the name of Julie Vraspir, in her young twenties. She was involved in a car accident, a nasty accident. They had to bring in the “iron claws” and rip open the car to get her out. They had to bring in the chopper and fly her down to Harborview Hospital. Meanwhile, for three hours, the family didn’t know if she was living or dying. It was absolutely petrifying. I was with the family on the ride down to the hospital. I know what this family was feeling simply because I am a parent. Anytime one of our children is seriously injured or ill, we are deeply upset. Therefore we can really understand the story for today because we find a woman who was very upset that her daughter is very, very sick. The Bible tells us that she was severely possessed by a demon. In those days, during Biblical times, they did not have concepts of viruses and demon possession was a common diagnosis by doctors. There is another story in the Bible about another child who was reported to be severely possessed by a demon and then the Bible author later called it epilepsy. Can you imagine during Biblical times and your child goes into convulsions? You don’t know what causes it. Can you imagine living with convulsions within your child and not knowing the cause of it? So you go see the local doctor by the name of Dr. Abrahamson and he says, “Well, your child has a bad demon. What did your child do that was so bad or what did you do that was so bad she got a demon living inside?” That wasn’t very nice but happened again and again in Biblical days. Well, this woman, in spite of the so-called help from her doctor and her friends at the Ladies Aid, decided that she would go and find this Jesus of Nazareth who happened to be in town that day. Jesus was now up north, north of the borders of Israel, the first time he had traveled outside of Israel. Jesus was a small town country boy who never traveled much. He never got out of town very often. But at this time in his life, Jesus traveled north to the city of Tyre and met a Canaanite woman, a non-Jewish woman who had a very sick kid. What does Jesus do? He turns his back on her and gives her the silent treatment. That doesn’t seem very nice to me. The woman is a Greek person. She has a sick kid. She is not intimidated by silence. The resistance of Jesus and his disciples does not intimidate her. Jesus looked at her and smiled and said, “Great is your faith, woman. Depart, your daughter is healed.” The woman went home and found her daughter well. That’s the story. It is a wonderful story from the Gospel of Matthew and also the Gospel of Mark. There are many things that can be found in this story but at the heart of this story is that this woman was not a Jew. The Bible is very explicit. She was a Canaanite. This is one of several examples from the New Testament where truth faith is found outside the organized religion of the day, where true faith is found outside the Jews, where true faith is found outside the Israelites, where true faith is found outside of organized religion. Often, that is true. Often you find the greatest examples of faith in people outside the church, outside the Christian religion. For example, this past week was the eightieth birthday of Mother Teresa on August 27th. This past week, there was a wonderful film on Mother Teresa’s life. This film was shown several times on PBS this past week. In this film, it showed her as a young woman growing up in Yugoslavia. The movie showed that there were Hindus and Muslims and Christians all in the same town. Mother Teresa grew up with all these different religions. Years later, when Mother Teresa was on the streets of Calcutta and people were dying of starvation, she didn’t say, “O, God loves Buddhists more than he does Hindus more than he does Catholics.” It was her deeply felt belief that God loves all children of the earth and God does not have any favoritism for starving Jewish children over starving Muslim children. God loves all children of the earth. Likewise, you don’t have to be a Christian and you don’t have to be a Lutheran and you don’t have to be part of the church to have deep faith in God. You just don’t. This is one of the first things that Jesus is saying to us in this story. Here was a woman who was a Canaanite and she had deep, deep faith in God. What is it that I like about this woman? One thing I like about this woman is that she did not put up with the evil that was part of her life. She didn’t go along with the local Ladies Aid and say, “Whatever will be will be. Your daughter has these convulsions and that is just the way that life is. You just have to put up with it and live with it. That is your God given destiny. To live with that evil thing that is part of your life.” That woman said NO to such logic. You won’t catch me having the attitude, “It’s inevitable. There is going to be a nuclear war. Whatever will be will be. O, it’s inevitable, there is going to be a war in Iraq. Whatever will be will be. It’s inevitable. My daughter or my granddaughter or my son or my grandson are going to get a divorce. Whatever will be will be. O, the kid is on drugs. Whatever will be will be.” No. When there is evil that is part of your life, you go to work and try to eradicate it. Nine times out of ten it is not God’s will that this evil be part of your life. Now, I am keenly aware that there are times in our lives where we need to surrender to the evil of life. Mother Teresa talked about the importance of surrendering to God and surrendering all of your life to God. I talked to this person this past week who has to surrender her mother to Alzheimer’s. Somebody else this past week has to surrender their house into bankruptcy. Another person has to surrender a spouse to the inevitability of a particular virulent cancer. But nine times out of ten, that is not true. Nine times out of ten in our lives, we are to rise up and fight against those things which are evil. The local Ladies Aid and the local doctor and everybody said, “Whatever will be will be” And this woman said, “Nosiree.” I am going to fight against this evil in my life. The other thing that I like about this woman is the way she prayed. She prayed in such a way that she was constantly bugging God. I love that passage where she comes up to Jesus and says, “Jesus, heal my child.” Jesus gives her the silent treatment. (Doesn’t that sometimes happen to us when we pray to God? It seems all we get is silence.) But this woman wasn’t intimidated by silence. She wasn’t intimated by the silence of Jesus. So she goes and asks the disciples, “Tell your master to heal me.” And they say, “He’s busy with other things. He has to heal the Jews first and then the Greeks.” This woman is not intimated by the disciples’ response either. For a third time she tries. She comes to Jesus and says, “Heal my child. Please.” And Jesus replied, “Woman you are like a barking dog, like a yelping puppy underneath the table at lunch time.” She quickly replied, “But even a master feeds a barking dog and he shuts up. Feed me and I’ll be fine. Heal my daughter and I’ll be quiet.” It was the persistence of this woman in prayer. The moral of this story is that is the way that God wants us to pray. God wants us to pray with that kind of bugging, nagging persistence. God says, “That is the way we are to pray.” We are constantly to be bugging God, coming after God and asking these things. It is that kind of persistence that is needed in our prayer life. Where we go to God constantly, asking God to overcome those things which are evil in our lives. We go and ask God for that evil to be eliminated, for that healing to occur. Now, for some of us, God is so busy with the big issues of life that he doesn’t have time for my little petty concerns. God is in charge of the laws of nature, the laws of thermodynamics, the laws and physics and God is running around taking care of all the big laws of the world and God does not have time for me and my little problems. That is NOT what Jesus teaches. Jesus teaches that God is concerned about our cancer, that God is concerned about our bankruptcy, that God is concerned about our drug or drinking problem, that God is concerned about our marriage which is having problems, that God is concerned about all these things which for us are not petty at all. God wants us to come and persistently ask him in prayer. Well, I love that story about this woman. I can see this woman coming up to Jesus and saying, “Heal my child.” And Jesus gives her the silent treatment. How often do we get silence from God. But silence is not to intimidate us. And so she says again, “Jesus, please heal my child.” Jesus replies, “I am busy healing the Jews first. The Greeks come later.” She said, “I need help now.” She was not intimidated by the apparent busyness of Jesus. That is the way we ought to pray.